The recent trend of building high performance entertainment and gaming PCs for the modern living room is compelling manufacturers to reduce their systems' dimensional proportions, slowly but steadily increasing the popularity and market of small form factor (SFF) products. With PC case and system manufacturers trying to compete with both each other and gaming consoles, the selection of SFF cases increases with each passing day. Yet despite the increasing popularity of SFF cases/systems, there is still a rather limited selection of SFX PSUs available, with most manufacturers shyly releasing a unit or two. SilverStone, thankfully, is an exception to this rule, as they are one the few companies that is almost entirely focused on the SFF/SFX market and offer a very wide range of products. For SFX PSUs alone, we have reviewed their mainstream ST30SF and ST45SF units, as well as the exceedingly powerful SX700-LPT and SX800-LTI. In today's review, we are taking a look at another SFX PSU from SilverStone, the Nightjar NJ450-SXL. A quick glance at its electrical specifications reveals that it is a highly efficient design with an 80Plus Platinum efficiency certification. 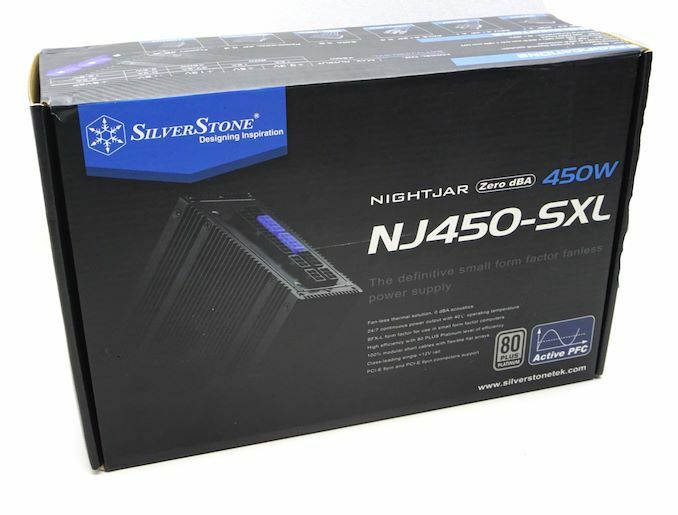 But what makes the Nightjar NJ450-SXL really unique is that the PSU is entirely passively cooled. 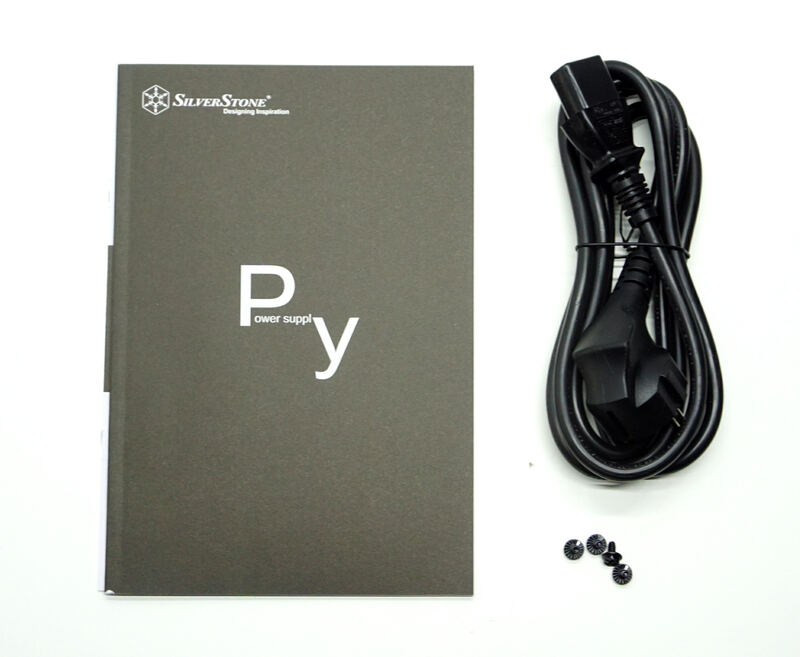 Passive PSUs are as rare as hen’s teeth and this is a scarce chance to see what a reputable company has managed to develop for a passive power supply in an SFX form factor. SilverStone has us used to practical and aesthetically simple packaging. The packaging of the Nightjar NJ450-SXL is no exception, with a mostly black cardboard box that is focused on highlighting the product’s features and protecting it during shipping. Despite the class of the PSU, SilverStone only supplies the absolute minimum items required. Inside the box, we found only the four typical black mounting screws, an AC power cable, and a thorough manual. There are no cable ties, straps, adapters, or any other accessories included in the Nightjar’s bundle. The SilverStone Nightjar NJ450-SXL is a fully modular PSU and every cable can be detached, including the 24-pin ATX cable. All of the cables are ribbon-like, “flat” type, and relatively short when compared to typical ATX products. 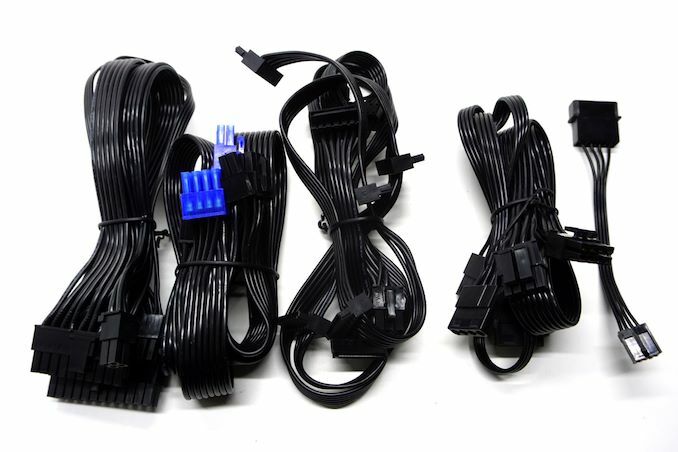 The shortened cables are the reasonable choice considering that the PSU may be installed in very confined spaces where every millimeter matters. Plus, since SilverStone does not supply an SFX-to-ATX adapter, they probably expect that users will not be installing this PSU in an ATX case anyway. I can only offer anecdotal support but I don't think you should worry about that, as long as the PSU itself is of good quality. I've been using the same Seasonic SS-FL460 (a fanless 460W, Gold-rated unit) since 2011 and while it's still powering the same i7 2600K I bought along with it it's scaled perfectly all the way up to a Vega 56, 4 HDDs and a SSD. I don't game 24/7 by any means but even when stressing the unit as far as my setup allows (Prime95 + FurMark) it doesn't get particularly warm. I'm in the market for a new desktop later this year and if I end up replacing the chassi and PSU as well it probably won't be with a fanless model. Not because of any issue with passive cooling but rather the noise. Thank you, that's good information! If I do switch PSUs it's likely going to be a Titanium unit, for the 10% efficiency minimum. Hitting ideal efficiency under load is usually easy enough at any load from 25-100% but I'm hoping to improve my efficiency at idle and basic desktop use too. A 650W Titanium unit should still be 90% efficient at 65W and that's not an unrealistic figure at the desktop, I think? > At least that's about what I'm seeing now, though obviously a more modern platform may well draw less power. Although the electrical noise is major irritant for those that suffer from it, it's by no means universal, and it's not just one or two manufacturer's that have this problem. I'm pretty sure it's also not even really model-specific in the sense that even within the same model some batches are problematic, and other's aren't. 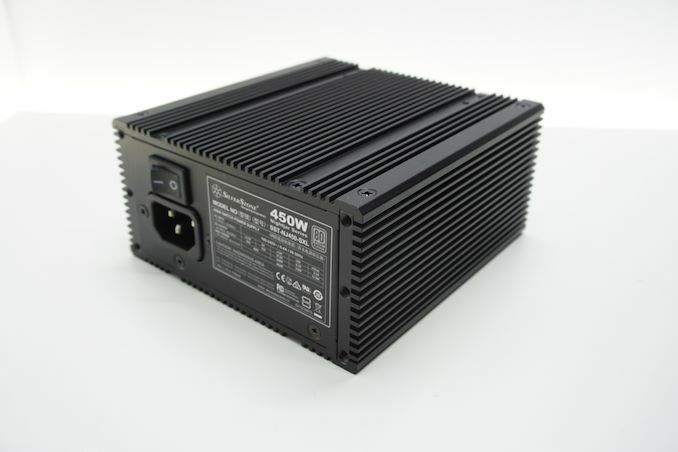 PSU electrical noises are usually high frequency noises and travel by air, so with NJ450-SXL's external aluminum heatsink shell having no vents, it actually helps reduce those noises better than any PC power supply ever could.